How did the PK5 District turn into a Muslim neighbourhood? PK5 is a commercial centre; it is the economic heart of the city of Bangui. The first Muslims from Chad or Sudan would pass through there to sell their merchandise, and little by little, they started to settle down, and other Muslims from neighbouring cities or regions followed. They married local girls from the Central African Republic, established roots, and bought houses. Many of them also became Central African citizens. The Muslim population grew and eventually Muslim citizens became the leaders in the trading business. And so, PK5 became a Muslim neighbourhood. How is life there today? The majority of the population in the PK5 District is Muslim, the remainder of residents are Christians and some stayed there even during the crisis. Today, the neighbourhood is divided into clans or ethnic groups: Haousa, Fulani, Bornu, Chadians, Sudanese, Gula, Runga, etc. There is great internal division accompanied by deep rivalries. How was PK5 before the violence broke out in 2013? Before the violence of 2013, PK5 was already considered a Muslim neighbourhood. The large market called KM-5, or kilometre 5, is a landmark, a place where traders, both Central African and foreign, meet. Muslims felt safe when they lived in PK5 because they did not face the discrimination and stigmatisation that Muslim citizens at times suffered outside the PK5 District. Nonetheless because of their monopoly of trade in the district, they were subject to controls by political and military authorities. Boris Modeste Yakoubou is the KAICIID field expert for the Central African Republic (CAR). 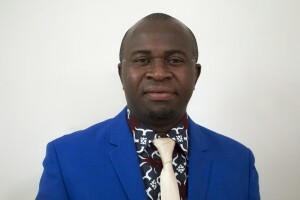 Boris contributed to the creation of the Platform of Religious Confessions in the Central African Republic where he worked for two years as an expert. He has been a member of the Peace Resources Group since 2009 and also works as an expert and consultant in social cohesion and reconciliation programs and on interfaith dialogue in CAR and the Central African sub-region on behalf of national and international NGOs. He has organized several interfaith conferences, forums and seminars for management and peacebuilding, human rights and good governance. He is a research professor at the University of Bangui, where he also conducts seminars on peaceful communication, management and conflict transformation.